For the second quarter running, Apple executives this week talked up the growth of the company's Services category in an attempt to highlight the earnings potential of the devices now in customers' hands. "The Services business is powered by our huge installed base of active devices, which crossed 1 billion units earlier this year," said CEO Tim Cook during the Tuesday earnings call with Wall Street. "Those 1 billion-plus active devices are a source of recurring revenue that is growing independent of the unit shipments we report every three months." Cook's comments were an abbreviated version of the argument that Apple's CFO, Luca Maestri, made in January during that month's call about the December 2015 quarter. At the time, Maestri spent significant time delving into Services -- a category that included revenue from iTunes, the App Store, AppleCare, iCloud, Apple Pay, licensing and others -- and trumpeting Apple's ability to earn money from current customers. Although Apple has been breaking out Services in its quarterly financials for more than a year, January's call was the first time the company beat the segment's drum to Wall Street analysts. "We have built a huge installed base around four platforms, iOS, Mac OS, watchOS and tvOS," Maestri said three months ago. "We have tremendously satisfied and loyal customers who are engaged with our services at a fast growing rate. All of this provides us with an unparalleled foundation for the future of Apple business." This week, Cook called the Services business "huge" and made clear the intended audience for all the talk about the category. "We felt last quarter, and working up to that, that we should pull back the curtain so that people could -- our investors -- could see the Services business both in terms of the scale of it and the growth of it [emphasis added]." For the March quarter, Services generated nearly $6 billion, representing a 20% growth rate compared to the same quarter in 2015. A chunk of that, however, was a one-time payment of $548 million from Samsung, triggered by a patent lawsuit between the two device giants. Minus Samsung's check, Services grew 11% year-over-year. Analysts interpreted Apple's attention to Services in surprisingly similar ways this month and back in January. "On one hand, it's trying to change the narrative," said Jan Dawson, principal analyst at Jackdaw Research, in a January interview that was never published. "Unlike device sales, which are very unpredictable, services are a very stable, very predictable business." And Apple wanted to make sure everyone heard that. The desire to change the conversation, Dawson said then - and today in a follow-up interview - was that Apple knew it was going to be reporting a slump in iPhone sales in 2016 because it would fail to match the mammoth bulge produced by 2014's iPhone 6 and iPhone 6 Plus, the firm's first large-screen phones. Dawson's view in January was echoed at the time by Brian Blau of Gartner. Apple wasn't using sleight of hand, but instead simply looking for some good news to report with the bad, the analysts argued. "Apple had to have known about [weaker] iPhone sales and their dependence on the iPhone, and they knew they had to do something," Blau said in January. He speculated that Apple was prepared long ago to trumpet Services, but put the discussion in its back pocket for when it needed a diversion. The $6 billion that Services recorded for the March quarter was significant, putting it in the No. 2 spot behind the iPhone's massive $32.9 billion and trumping the Mac's $5.1 revenue stream. Although without the Samsung payment factored in, Service's $5.5 billion was less impressive. For all the talk about Services' growth, however, neither Dawson or Blau saw the category as more than peripheral to Apple's revenue fortunes. 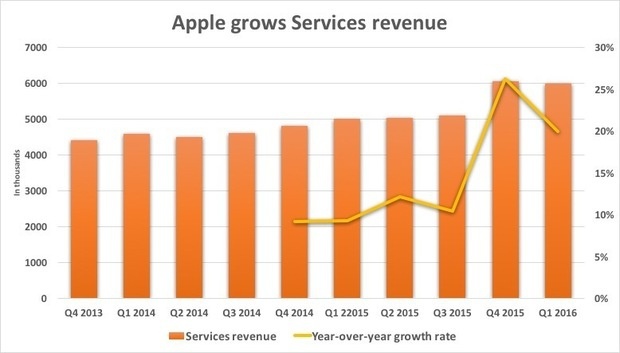 In the March quarter, for example, Services accounted for 11.8% of all revenue, compared to the iPhone's 65%. "Services can never make up the difference," said Dawson today, referring to shortfalls in iPhone revenue. "Services is great, it grows off the installed base, but it's still small and it can't ever change the instability of product sales. Apple and investors have to accept that huge unpredictability. Apple is not a services business, it's small in the grand scheme of things, and it's not big enough to become the narrative." Dawson had a point: The iPhone revenue difference between 2015's March quarter and this year's was $7.4 billion, more than not only the $6 billion that Services brought in, but more than seven times the increase of Services over 2015's first quarter. The highlight of Services may have had other purposes, the analysts said. In January, both Dawson and Blau pointed out the likelihood that Cook's touting of Services presaged a bigger play in the category. "We may start to see Apple take more ownership of some app content, and maybe acquisitions as well," said Blau. But he thought a video-based service was the most likely, not a big stretch since Apple's interest there has been discussed for years by analysts, pundits and Apple enthusiasts. Dawson echoed Blau today. "They called Apple Music their first subscription business," Dawson said of remarks by Cook on Tuesday, noting that the CEO wouldn't have said as much if he wasn't implying there will be more coming. "Video would be the most obvious." The Services category of Apple's revenue report reached $6 billion in the March quarter, down slightly from the December 2015 quarter. Services boasted a year-over-year growth rate of about 20%, or 11% if the one-time payment from Samsung was discounted.